The University of Illinois Fire Service Institute (IFSI) has introduced a new book - "Rope Rescue Technician: Field Rope Operation Guide." The book developed by IFSI Instructors Mike Woodard and Ryan Evans features 19 unique sections that cover all aspects of rope rescue and serves as a handy, pocket-size reference guide for first responders along with color illustrations by Tracy Guidera. 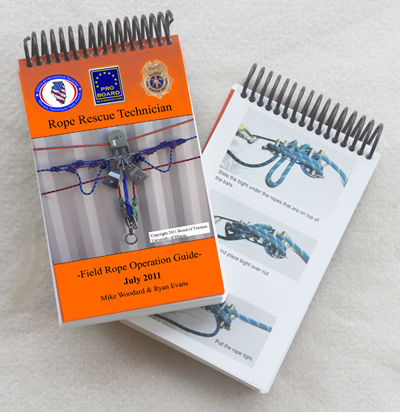 The book is used as part of IFSI Special Operations Training Program's Rope Rescue classes. Fully-illustrated with easy to follow photographs, the guide includes sections on knots, anchors and haul systems. Techniques critical to successful rescue operations are covered, such as ledge rescue, line transfer, ascending and converting, as well as patient packaging and high lines. The book includes "dos and don'ts" as well as tips on un-jamming racks and other problems that might be encountered during a rescue. Use the online form below to order your guide today. "As an instructor, I saw a real need to have a reference guide for knots, systems and multiple rescue scenarios." - Mike "Woody" Woodard, co-author. "It's a valuable tool for review away from the training grounds." - Ryan Evans, co-author.